View More In Accent Plates. Add an additional fun flair to your dinner table or backyard BBQ. These Talon Tableware dishes were made to hold a single ear of corn providing the perfect place to spread on delicious butter and other toppings. The high gloss buttery yellow ceramic is stylish, durable, and a wonderful conversation piece. 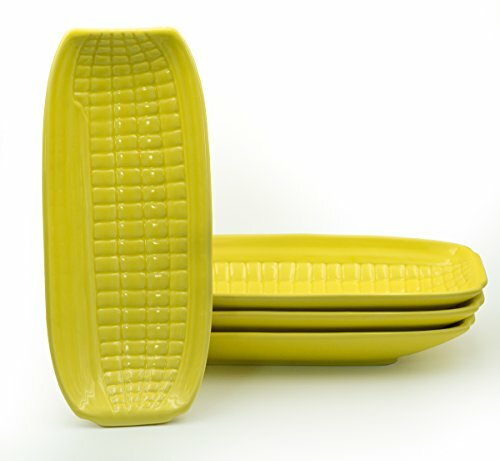 The depth of the plates can not only hold corn, but can also be used for side dishes or as candy dishes year round. Comes shipped with extra protection. Dimensions: 9" long, 4.5" wide, 1.5" tall. ⭐️ Perfect size for buttering corn-on-the-cob. 9" x 4.5" x 1.5"
If you have any questions about this product by Talon Tableware, contact us by completing and submitting the form below. If you are looking for a specif part number, please include it with your message.